Ponta Delgada, Sete Cidades, Ponta da Ferraria, Furnas (Sao Miguel Island), Horta (Faial Island), Pico Island, Sao Jorge Island, and more! The North Atlantic’s Azores, like Hawaii, is a remote volcanic archipelago. 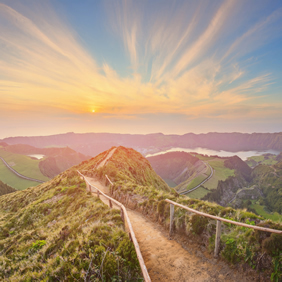 This active gay group trip explores the crater of Sete Cidades (one of the 7 Wonders of Portugal), bathes you in natural thermal pools, and includes a world-class whale watching excursion. You'll have the opportunity to explore four iconic islands including São Miguel, Faial, Pico and São Jorge. Want to maximize your time in Portugal? Pair this tour with our Lisbon & Porto Gourmet Foray Gay Group Tour – a culinary tour of the country's mainland that immediately follows this tour. • Virtually all meals included, along with water and soft drinks. Beer and wine included at dinners. Olá! 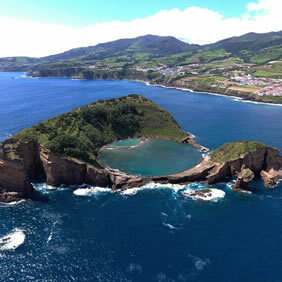 Welcome to Portugal’s Azores Islands! Since most flights arrive in the morning, we’ve confirmed early check-in at the hotel – have a snooze before our Group Meeting at noon! We’ll venture out to explore Ponta Delgada – capital of the Azores – to sample tapas in the city's celebrated bars and restaurants. We’ll also see Portas da Cidade (the town gates), Matriz Church, City Hall, São Bráz Military Fort, and São Francisco Square. Freshen up before our Welcome Dinner. It’s at a slick waterfront restaurant featuring sublime local fare. Let’s get physical at Sete Cidades, the twin lakes in the crater of a dormant volcano. Kayak, standup paddle board, or bike and hike your way around the volcanic complex. With appetites worked up, savour a traditional Azorean picnic on shore. We’ll then drive the south coast to visit Ponta da Ferraria, a thermal pool heated by the surrounding volcanic vents, and if the tide permits we’ll even have a soak. The evening is yours to enjoy on your own, or at an optional group dinner. 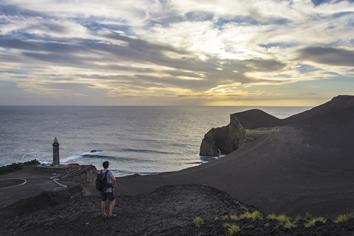 After we fly to Faial Island, let’s get to business with a hike through Capelinhos Volcano. You’ll visit the site of a volcanic eruption, an experience compared to walking on the moon. When we reach the historic lighthouse/modern interpretation centre, we’ll see the newest part of the island, born during the eruption of 1957. A picnic lunch is served in a natural forest reserve, then we continue on to Horta and its famous marina. From here, savour an afternoon gin and tonic at Peter’s Café. Tonight’s dinner is at a local restaurant where – if the owner is around – he will regale us with tales of circumnavigating the globe two times by sailboat. 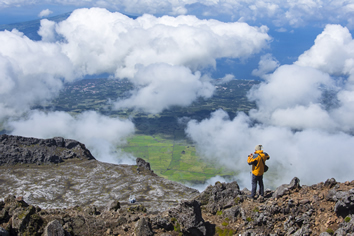 After we take a 30-minute ferry to Pico Island, choose your own adventure! 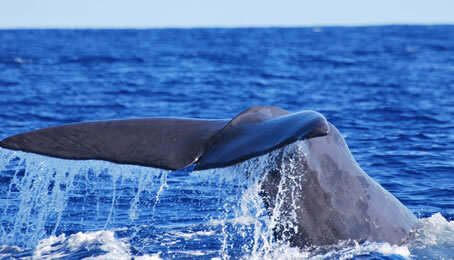 Enjoy a laid-back whale- and dolphin-watching tour in Lajes do Pico. We can’t guarantee cetacean sightings, but look for turtles, seabirds, and other marine mammals. After lunch, we’re off to Gruta das Torres, a volcanic formation, followed by a Pico Island cultural tour. The day ends with drinks at a local bar. PLEASE let us know if you have any back problems, as there are some restrictions on the tour boat. If you fancy a technical challenge, and don’t have knee or ankle problems, hike Portugal’s tallest mountain (2,351m/7,713ft)! A picnic lunch is served, with time for cocktails at a local bar. Both groups then ferry back to Horta. Dinner is a short walk from the hotel. The menu features fresh fish, local seafood and meat. Our ferry to the São Jorge Island is just over two hours. We then transfer to Serra do Topo for a downhill hike of medium difficulty. It covers 10km/6.5mi and should take about 3 hours. We’ll see the astonishing Caldeira do Santo Cristo, clams that grow in a saltwater lagoon, and maybe some surfers on what may be the longest waves in Europe. Lunch will be served on the terrace of a surf house, and the day wraps with a visit to Fajã dos Cubres – a debris field built by collapsing cliffs. After we transfer to our hotel and check-in, a group dinner is served. The day begins with a flight back to São Miguel Island. Upon landing we head straight to one of the Azore's most beautiful, naturally preserved lakes: Lagoa do Fogo (Fire Lake). We'll spend almost 4 hours hiking this stunning lake which covers 11km/7mi. We'll then check in to our fabulous hotel which boasts its own thermal pools, and one of the most spectacular gardens in the country. Tonight’s dinner is at the hotel, and the night ends with a private party at one of the outdoor pools where a private bartender will shake up cocktails for all. Begin the day with a bike ride from the village to Furnas Lake for a picnic lunch. 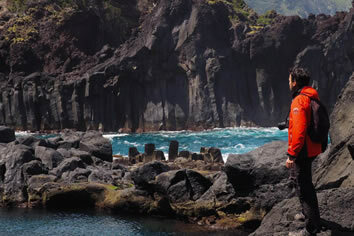 From there we’ll transfer to Faial da Terra for a 2.5h hiking tour of the island’s interior. Our walk along a steep, narrow road leads to Sanguinho – a village abandoned since the 70’s that’s in the midst of a restoration. The remainder of the trail goes through woods with short hilly stretches through dense vegetation. Upon reaching Salto do Prego’s waterfall you may opt for a brisk dip (the water’s chilly) before we head back along a different route. Enjoy a refreshment in town and some mingling, then join us for our Farewell Dinner. We have one short activity this morning – a visit to Europe’s only tea plantation. After lunch and some time to shop, you’ll be transferred to the airport at 3:45PM, officially ending our Azorean escapade. You may wish to continue your tour with Out Adventures on our mainland Portugal Lisbon & Porto Gourmet Foray. If not, we wish you safe travels home, and Até à vista! • All meals EXCEPT dinner on Day 2. Beer and wine included during dinners. • Travel insurance is mandatory for all travellers. If your passport is from the USA, Canada, Britain, EU, or Australia, you don't need a visa. There may be exceptions, and all visas are the traveller's responsibility. Portugal is a highly-developed Western nation - one of Europe's oldest, in fact. Crime rates are low and the nation is generally safe, but beware of pickpockets and petty theft anywhere that's popular with tourists. It's best to leave valuables at home or in your hotel room. Portugal offers some of the best LGBT rights in the world, but it's still a conservative Catholic country, and the Azores have no gay hotspots to call their own. You can expect to be safe from phyiscal harassment, but beware public PDAs could conjure shady looks from the locals. Portugal is one of Europe's warmer countries, so the temperatures, crowds, and hotel prices can be tragic come summer. That makes spring or fall (April/May, September/October) a splendid time to visit. The WHO suggests immunization against Hepatitis A and B, rabies, and influenza before visiting Portugal. If visiting the Azores or Madeira Islands from a country infected with Yellow Fever, a vaccination certificate is required. To determine if you should take preventative measures to reduce the risk of illness, consult with your doctor or a travel medical clinic, as we cannot provide vaccination recommendations. All of our hotels will have Wi-Fi access. Feel free to check email and post away on social media. This is a fairly active trip. Activities include hiking, kayaking, stand up paddle boarding and cycling, with some warranting peak physical condition. Aside from dinner on Day 2, all meals (breakfast, lunch and dinner) are included. Beer and wine are included during dinners. Situated in a 19th-century building on São Miguel Island, this hotel is a 5-minute walk from the University of the Azores and the seaside. It offers a swimming pool and free WiFi throughout. 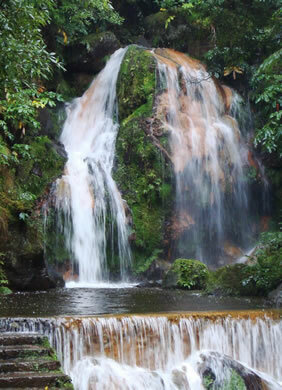 Situated in the Furnas Valley, Terra Nostra Garden Hotel is surrounded by calderas, mineral and thermal springs. It is a short drive from volcanic beaches, forest areas, and two golf courses. If you are happy with services throughout your trip, a tip is recommended. Tipping details will be provided in your final trip documentation, however we recommend budgeting approximately $150 USD. The local currency is the European Euro (EUR). Use local currency for small purchases, however credit cards are accepted at most upscale restaurants and hotels. NOTE: We recommend carrying approximately $400 USD to be used in case of an emergency, or if your credit/ATM cards are placed on hold. This should be in addition to any spending money. We love when groups of friends join us on an OUT Adventure, whether you're celebrating a major milestone, or you just love to travel together. However, since we have travellers that will be flying solo, or as a couple, we would love your help ensuring everybody feels welcome and has an epic time. 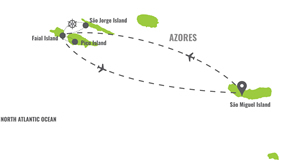 Price does not include airfare between Ponta Delgada and Horta Island.